The National Oil Corporation’s (NOC) budget should not be politicized, Mustafa Sanalla, the chairman of the Libyan organization warned today. 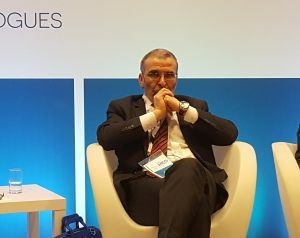 Sanalla was speaking at a session entitled ”Libya: Enhancing the Economic Prospects” in Rome at the 2017 Mediterranean Dialogues conference and shared a panel with a number of Libyan officials including Tarik M. Yousef, a Central Bank of Libya board member. UNSMIL head Ghassan Salame was present in the audience. ”The subject ”enhancing economic prospects in Libya” is timely and is fundamental for Libya’s future and, in particular, for its youth. I am firmly of the opinion that political stability will be much more difficult to achieve without economic reform. In fact, I believe that many of the young people caught up in current power struggles and militia competition would choose a different course, if Libyans had greater economic opportunity. The elements of the reforms that are needed in Libya are not a secret. Private enterprise opportunities must be created. The Government needs to balance its budget. And as part of this, subsidies on fuel must be lifted with consideration of social impacts. But one priority is paramount: we have to keep the oil flowing. Interrupting or threatening to interrupt oil production to gain political leverage is completely unacceptable. It gravely harms the nation, and for that reason, I believe, people involved in blockade actions delegitimize themselves. I will make a prediction today: When Libya’s political situation stabilizes, the country’s leaders will be those who have shown they have the country’s best interests at heart, not those who pursue the agendas of outside powers, nor those who inflict more pain on their countrymen to gain power. And yet, one of the conundrums of Libya is that while the entire country depends on revenues from oil, almost every political group or armed group is engaged in behaviour which threatens production. For this reason, in October, as some of you will know, the National Oil Corporation hosted a consultation at Windsor Castle of key institutions from inside and outside Libya to define concrete, practicable steps to protect Libya’s oil industry and assets, and to establish a solid economic platform for political transition. The consultation produced tangible results. One was a statement of principles on the exploitation of Libya’s oil wealth agreed by the participants. NOC will forward the principles to the national conference to be convened by the UN Secretary General’s Special Representative Ghassan Salame as part of his action plan, to be agreed by all political actors in Libya. 1 – The exploitation of Libya’s oil and gas resources shall be for the benefit of all Libyan people, regardless of location. 2 – NOC and its subsidiaries shall have a monopoly on the exploration, production, transport and export of oil and gas. 3 – All NOC revenues shall be sent to the Central Bank of Libya in a transparent process with details reported to the Libyan people. NOC and its subsidiaries will be adequately funded in an equally transparent process by the Government of Libya in a timely manner to ensure the optimal level of production and exports. 4 – Attempts to blockade oil, misappropriate oil and equipment, disrupt or prevent the production or transport of petroleum products are condemned by all parties, and shall be prosecuted to the full extent permitted by Libyan and international law. 5 – No concessions or payments will be made to blockaders or disruptors. 6 – The security and safety of Libya’s oil will be maintained through implementing security measures consistent with international professional standards as accredited by the NOC. 7 – New deals with IOCs to attract investment in the oil and gas sector will be agreed in a transparent manner and in accordance with Libyan law. 8 – Appointments to the Board of the NOC and its subsidiaries should be based on an open and transparent process, focusing on professionalism, competence and experience in relevant business roles. We are now concentrating on implementing those principles and on achievable near-term goals harnessing the capacities of NOC and the other state agencies to counter blockades; stepping up anti-smuggling efforts; pushing for the reform of the Petroleum Facilities Guards; establishing employment policies that work; and, finally, and most importantly, since the entire Libyan population depends on it, ensuring adequate investment in Libya’s oil production. There is no silver bullet to any of these problems, but we can act. We must increase revenues from oil production. And to do this, we will need to establish a shared national interest in increasing production and exports. I believe this needs to be the basis of a new social contract in the Libya of the future. As you may have heard, we at NOC plan significantly to increase investment over the next two to three years to $20 billon. The investment is earmarked for a number of key projects. Some of you will be aware that NOC’s capital expenditure budgets have been withheld and that this threatens our ability even to maintain production at current levels. So you may ask how we will be able to get project investment of $20 billion to expand production if we cannot secure $2 billion to maintain production. In my opinion, the most important Windsor Principle is that the exploitation of Libya’s oil and gas resources shall be for the benefit of all Libyan people, regardless of location. This means revenues must be shared across the country. And it means foreign companies must incorporate local content, environmental protection and community relations components into their proposals. It is also in my view especially important that work done by foreign companies in Libya provides local economic opportunities. We mustn’t underestimate the seriousness of the problems Libya faces. But we see daylight. We hope to improve security and cut down the rate of interruptions. We hope a political solution will be reached. What we hope for 2018, in other words, is progress better security, investment, increased production and more economic opportunity for Libyans. And that will benefit everybody”, concluded Sanalla.